Easy Brain Teasers For Great Spelling & Vocabulary Practice! Try these easy brain teasers for some fun spelling and vocabulary practice! These quick questions are great to try to solve on your own. They're also fun to do with your family, students or co-workers. ESL students can enjoy these puzzlers, too. See our suggestions for using these questions at the bottom of the page. Here's a peek at our printable page. The full text also appears below for your convenience. 1. 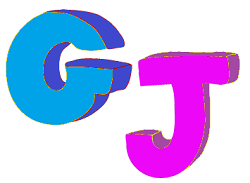 List 4 or more words that contain both a G and a J. 3. List 4 or more words spelled with four letters that contain only one consonant. 4. When the correctly-spelled words on this list are written in alphabetical order, which word is in the middle? 5. Find the pattern in this list of words and add two more words. 7. Find the pattern in this list of words and add two more words. 8. Spell at least 3 words that contain ff. 9. Unscramble these 3 related words. 10. List 2 or more words that are spelled with nn. Write a new question on the board each morning. Allow students to write their answers and place them in a special folder anytime throughout the day. At the end of the day, review their submissions and reward the students answering correctly by adding their name to special display, giving them a small treat, or in some other way. Use the printable version of all the questions. Allow students to work on the questions over a week or two. Then collect all their answers at the end of that time. Award extra credit for correct answers. Always be sure to review correct answers with the entire class. Ask students to write similar questions of their own for classmates to solve! Picture Puzzler and Letter Logic - Two work sheets of spelling and logic fun! 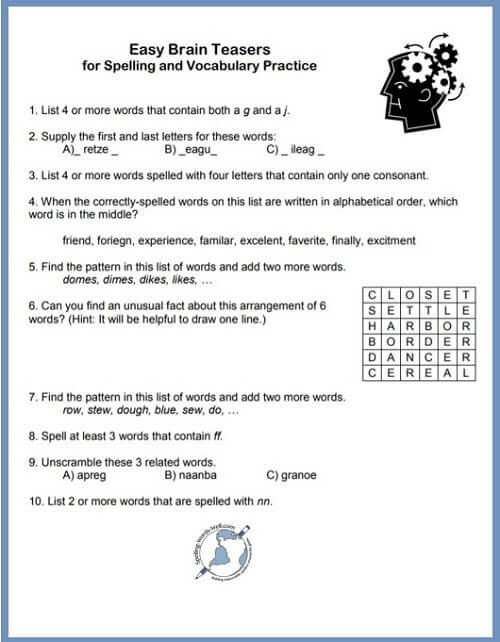 You and your students may also enjoy these Brain Teaser Games from www.word-game-world.